SURABAYABROMOTOUR arranges Trips To Mount Ijen Crater Blue Fire, Sukamade (Turtle Beach), Kalibaru Plantations and Bromo Tour Sunrise durations around 5 days 4 nights. Tour Package to Ijen Blue Fire Sukamade Kalibaru Mount Bromo From Surabaya – Yogyakarta – Ketapang Ferry Port or Bali. Mount ijen is the valcano in Banyuwangi regency east java. 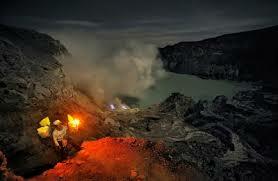 Tourism to view the big lake crater of mount ijen and blue fire. The phenomenon has occurred for a long time, but ago there was no climb at midnight before National Geographic popularize the electric-blue flame of Ijen. To reach the top of mount ijen and view lake creater and blue flame, visitors must climbing two-hour is required to reach the rim of the crater, followed by a 45-minute hike down to the bank of the crater. 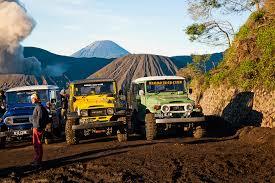 Free time exploration at mount ijen crater and blue fire. 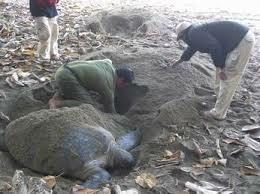 Sukamade Beach is located in Meru Betiri National Park, is a breeding turtles, especially green turtles. At night time we could see the turtle nesting and hatchling release into the ocean in the morning. Sukamade Beach has an area of 50,000 hectares. Betiri Meru name taken from the name of the highest mountain, the mountain (Meru) Betiri. The high mountain is 1,223 meters above sea level. To reach this place through the rubber plantations,coffee brown, and dense rainforest in the shore and cross the river to make several trips suspenseful. 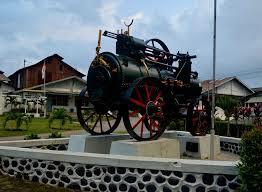 Kalibaru is the location of plantation tours and excursions lorry, a small train. Kalibaru is located at an altitude of about 428 m above sea level and land use mountain many for plantations and forest. Cultivated plants, among others, coffee, cocoa, rubber, tea, and pine. Which is Interesting here there is a statue of a hand holding a cocoa. In morning mist often down so cold air like in countries four seasons .Perkebunan Kalibaru and the cold temperature of the main attraction for foreign tourists. We pick you up at Surabaya or Ketapang Ferry Port or Bali then drive to the Ijen hotel. You spent the night in a home stay at the Ijen area. Very early morning (00.00 am), before we depart with to Paltuding. It takes about one hour to reach Paltuding, the ‘entrance’ to Kawah Ijen. It will take you around an hour to walk three kilometres up hill to the crater. Finally at the top you have a spectacular view at a sea of colours; the turquoise lake, the yellow sulphur and the brownish red crater rim. A lot of sulphur miners carry loads up to 80 kilograms out of the crater up to the rim and then down to the weighing post in Paltuding. After you inhaled the scenery, there is time to visit the sulphur factory where sulphur is purified and packed. Then we drive via Pesanggaran to the protected Sukamade turtle beach. On your way we drive across the extensive plantations of East Java and the mountain range of the Meru Betiri National Park. The turtle beach is a wild three kilometers strip of sand at the Indian Ocean. Four species of turtles come ashore to lay their eggs at night. But, before the evening falls, you still have time to walk around the local kampong where people make brown sugar. At night a ranger will guide you to see the sea turtles. The sea turtles usually come ashore around at 19.30 and return to the sea at midnight. You overnight in a simple guest house in the Meru Betiri National Park. The next day, you can explore the surroundings of Sukamade and the National Park, if you like. Then, on our way to Kalibaru we can stop at the bay Teluk Hijau where you can swim or just enjoy the scenery. It is a six hour drive to Kalibaru, We stop on the way to have lunch at local restaurant. After breakfast, you can visit a local factory where coffee, rubber and chocolate (depending on the season what is harvested) are processed. Then, we continue to the village Cemara Lawang near mount Bromo. It will take about four to five hours to reach the village. Of course, we will stop for lunch. You spent the night in a village with a view at the Bromo landscape. All personal expenses such as room service, laundry, telex, facsimile,meals, telephone etc.